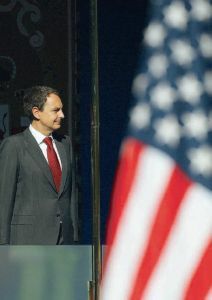 REMEMBER BACK IN 2003, when Zapatero still was the opposition leader and, in the parade on Spain's National Day on October 12 (the equivalent to July 4th, so to speak) he conspicuously remained seated when the American flag was passing by, and said "Why should I stand up? it's not my flag?" (see a picture at this post) This, and the abrupt surrender pullout from Iraq the day after he was sworn in after his surprise victory on March 14 (three days after the horrific terrorist attacks in Madrid) put him at odds with the US. And rightly so: the flag incident was not merely an offense to the Bush adminsitration at a time of a heated argument over the war in Iraq, but an insult to the American people as a whole. 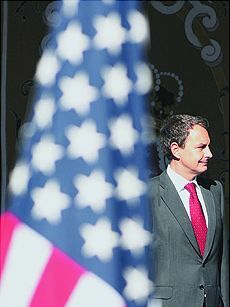 Of course, you could argue that a still picture doesn't prove anything; but all the accounts I've heard from people who were there (some talk radio is still willing to talk about these things here) say that indeed, Zapatero was standing up still and did his best so as not to look at the "flag of the empire." I may even have a video soon, but I can't promise.